Meeniyan is a small township straddled by the spectacular Wilsons Promontory and metropolitan Melbourne. Back in the late 1800s Meeniyan was established as a train station on the South Gippsland railway line. The station was operational for just over a century until 1991. The line is still visible and is part of the Great Southern Rail Trail.The old station and platform are still in situ. Today boutique shops and cafes populate either side of a wide communal tree lined median strip under delightful picnic seating and flowerbeds. The war memorial also sits between the cafes and shops and is a memorial which was installed by the RSL and used for ANZAC day services. The iconic Town Hall opened in July 1939, it was built to replace the original hall (1892), which burnt down the in 1938. It immediately became the entertainment centre for the district balls, dinners, movies, cabarets, debs you name it – 7 nights a week. The most enduring event was the Saturday Night Dance 1939 to 1976. Attracting up to 800 weekly from far and near. 1996 saw the start of extensive work by the community with the assistance from the local shire to update the hall facilities without losing its unique character. Once again the hall is the entertainment centre for South Gippsland. 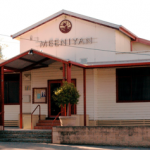 Meeniyan Progress Association and the Hall Committee both bring performers from the local area as well as Melbourne. The dynamic Lyrebird Arts bring entertainment at the national and international level.